In a world based on the Wild West, populated entirely by robots, you are the new sheriff in town, Tin Star. You must shoot your way through the bandits in a series of missions, earning dollars. Using either the Super Scope or SNES Mouse, you control the target reticule, shooting enemies and projectiles so they don't hit Tin Star. 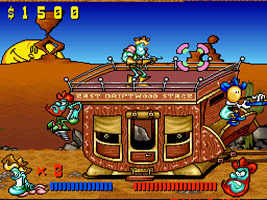 In some missions you play as Tin Star runs across a stage, or you may have to shoot hiding enemies from a first-person perspective. You can get a variety of endings depending on the money you've acquired for accuracy of your shooting.